Home › Announcements › Hood River Papers Available, Thanks to Hood River Library! Hood River Papers Available, Thanks to Hood River Library! Two historic newspapers from Hood River, Oregon — the Hood River Sun and Hood River Glacier — are now online at the Historic Oregon Newspapers website. These particular Hood River titles are available online thanks to the extraordinary efforts of the people at Hood River County Library and the History Museum of Hood River County. If it weren’t for the people at Hood River County Library and History Museum, the Hood River Sun especially would not be available. Amazingly, print copies of this historic Hood River paper were discovered in a closet at the museum! If they hadn’t found them, this content would have been lost forever! After this discovery, volunteers at Hood River County Library scanned issues of the Hood River Sun (and the Hood River Glacier) from print. This process veers from normal procedure in that historic newspapers are typically scanned from microfilm. Scanning these newspapers from print allowed these historic titles from Hood River, Oregon, to be accessible online at the Historic Oregon Newspaper website. Special kudos to Buzzy Nielsen, director of Hood River County Library, and Arthur Babitz, a local volunteer who is writing a book about the Hood River Sun. Eleven issues of the Hood River Sun have been added to Historic Oregon Newspapers. The dates of publication of the newly added issues range from September 28, 1899, to February 8, 1900. This date range spans the entire existence of the newspaper, of which only twenty issues were printed. Notable newspaperman Sloan P. Shutt established the Sun, which initially was delivered to homes throughout Hood River at no charge. Eventually the Sun became available by subscription, with a yearlong subscription costing $1.50 and a six-month subscription $1. Shortly after the release of the first issue, Shutt walked away from the Sun to pursue mining interests in Sumpter, Oregon. Eber R. Bradley took over and was editor and publisher of the Hood River Sun until its final issue, which rolled off the presses on February 8, 1900. The Hood River Glacier was the Sun‘s rival. As a matter of fact, the Hood River Glacier preexisted the Hood River Sun by an entire decade. The Glacier was the first ever newspaper in Hood River, Oregon, established in 1889 by postmaster George T. Prather. In an early issue, Prather claimed he did not enter the newspaper business to gain fortune. As a play on the paper’s title, he wrote, “If the little Glacier will slide along slowly and grind out its own expenses we [the publishers] shall be satisfied.” The first issue of the Glacier was published on June 8, 1889. The newspaper would remain in print for more than forty years, far outlasting its onetime rival, the Sun. 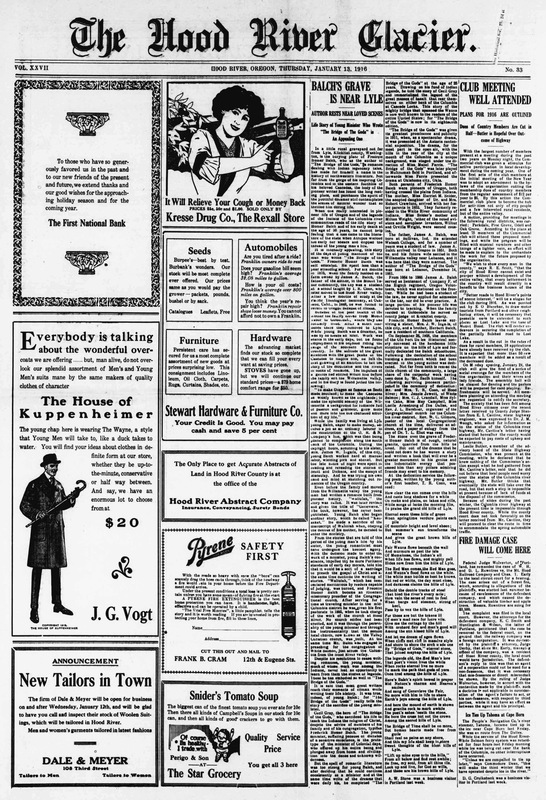 Nearly 1,650 issues of the Hood River Glacier have been added to Historic Oregon Newspapers, with publication dates ranging from June 8, 1889, to December 28, 1922. As with all newspapers on the Historic Oregon Newspapers website, these newly added issues of the Hood River Sun and the Hood River Glacier can be searched by keyword because of optical character recognition (OCR) technology. In addition, every issue of these historic Hood River, Oregon, newspapers can be downloaded and saved for future use as a PDF or JPEG file, at absolutely no cost to readers of Historic Oregon Newspapers. Thanks again to the incredible people of Hood River County Library for making it possible for these historic papers to be online! ‹ Plenty of Newly Added Historic Papers! Thanks for the judos! In all fairness, though, the Hood River Sun was actually found in the closet of the History Museum of Hood River County, where Arthur volunteers. We at Hood River County Library District just helped secure the funding to digitize it! Thanks for clarifying Buzzy! I just made the correction. Cheers!